Want the best deal on what our original Nikon Z7 review called ‘an instant classic’ of a camera? Then scan the details we’ve provided below. With the introduction of the 45.7 megapixel Nikon Z7 (and its 24 megapixel Z6 baby brother), early mirrorless camera pioneer Sony no longer has the full frame camera market to itself, while Canon has also recently joined the full frame party with its own EOS R system. Sensor-wise the Z7 has similarities with the Nikon D850, although here its manufacturer has fashioned a sophisticated on-sensor phase detection system that has, in turn, given rise to a whopping 493 phase detection AF points. With this new camera system also comes a new camera mount in the Z mount. At 55mm across, the Z mount is 11mm wider than Nikon’s existing F DSLR mount, which the manufacturer has suggested liberated its lens designers, plus allowed for a step up in optical quality too. 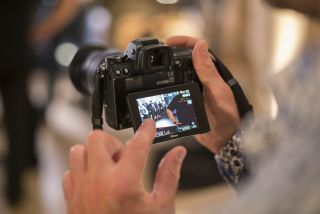 To help you to confirm that the Nikon Z7 is the correct camera for you, we’ve a brief round up of the model’s key features and specifications below. Here you’ll also find the best current prices for the brand’s flagship full frame sensor mirrorless camera. If it’s a very high-resolution camera you need, then the 45.7 megapixel Z7 currently offers the best deal in Nikon’s full frame camera range. Attendant features that will help you decide whether this is the right camera for you include a five-axis in-body stabilisation system reportedly providing the equivalent of five extra stops, which is a first for the manufacturer. Existing Nikon F lenses can also be utilised, via an optional adapter, which is a bonus for existing Nikon DSLR owners with an existing collection of lenses. Build quality, unsurprisingly at this price, likewise impresses. As on the Z6 we get a promised 200,000 shot shutter life, plus a weather resistant magnesium alloy body. In many other respects, save for headline resolution, the two cameras are very similar, including the controversial choice of a single media card slot for the less familiar XQD media format. That’s down to Nikon having one eye on the future and inevitable demands for higher capacity, but it does mean existing photographers having to demote their existing SD and CF cards to the bottom drawer. In terms of technology, the Z7 is similar to Nikon’s own D850 DSLR, albeit in more portable form and with a differing control layout. Despite this, the Z7 manages a decent sized handgrip, while the Z mount compatible 24-70mm f/4 lens released alongside the camera body is a neat and exact fit. While some photographers may prefer an optical viewfinder rather than the electronic variety the Z7 provides, here that EVF really struts its stuff, largely due to an amazingly sharp 3.69 dot resolution. Plus it is less susceptible to image lag and smearing than others we’ve used. If you prefer shooting with the camera held in front of you, however, the alternative of the rear LCD screen doesn’t disappoint either, partly due to its own 2.1 million dot resolution. It will also pivot up and down, but not sideways. Handily, the likes of selecting the focus point and firing the shutter can be orchestrated with a single finger tap of said monitor. In short, the Nikon Z7 is a very impressive camera. So much so that you almost forget that Nikon hasn’t been making full frame mirrorless models for years – and that this is just one of only two of its own in existence right now. All you need to do now is select the best deal!